A teenage girl discovers she possesses extraordinary powers. The director Bryan Singer has said he was attracted to the X-Men franchise because growing up gay and Jewish, he related with its central theme of struggling to fit in with a society that views you with suspicion. The X-Men series is full of young people struggling to suppress urges deemed unnatural by the powers that be. For his fourth feature, Norway's Joachim Trier, teaming once again with his regular co-writer Eskil Vogt, explores this idea in decidedly more explicit fashion. Returning to his native country after a stint in English language filmmaking with last year's under-seen and under-rated Louder Than Bombs, Trier tells the story of the titular Thelma (Eili Harboe), a teen who leaves her rural home to take up a place in an Oslo college. Raised in a conservative Christian home, Thelma keeps to herself, avoiding the boozy parties that take place on her campus and burying her head in her books. While studying at the college library, Thelma succumbs to what appears at first to be an epileptic fit. Another girl, Anja (Kaya Wilkins), comes to Thelma's aid, and the two strike up a friendship. Initially their relationship is platonic, but Thelma begins to develop lustful feelings for her new friend, and with these urges comes more fits and the revelation that she possesses supernatural powers that have been kept suppressed since a tragic childhood incident. 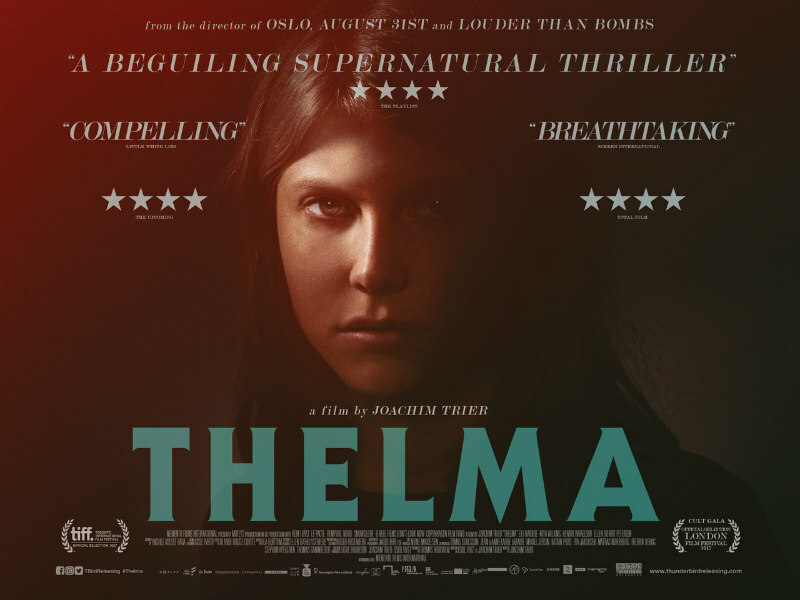 The concept of Thelma is hardly an original one. We've seen the idea of a young girl's frustrations manifested through telekinetic powers in everything from Stephen King's Carrie and Firestarter to Netflix's Stranger Things, and of course the aforementioned X-Men franchise. What makes Trier's film feel fresh is the central relationship between its eponymous anti-heroine and the angelic Anja, and its exploration of the damaging effects of religious suppression of one's true nature. Thelma finds herself treading a path towards tragedy and violence, as the powers her parents (Henrik Rafaelsen and Ellen Dorrit Petersen) kept suppressed become unfettered in their absence. The message of the film seems to be that parents should embrace their children's identity rather than attempt to mould it into one that conforms to their own beliefs. This of course is a very admirable idea, but the revelations that come out about the grave consequences of Thelma's supernatural condition make the queer analogy at best redundant and at worst dangerous, and it's difficult to blame Thelma's parents for stifling her abilities. While ultimately Thelma doesn't quite succeed as a slice of allegorical sci-fi in the manner intended, Trier's thoughtful approach, the stunning visuals that adorn the narrative, and an endearing central performance by Harboe, who does great work in communicating the confusion and frustration of her character, make it the most rewarding film of its type since Carrie. Thelma is in UK cinemas November 3rd.